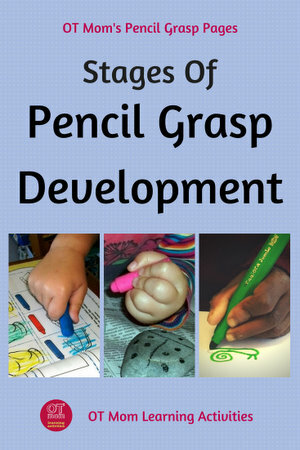 Moving through the different stages of pencil grasp development is an important part of childhood development. Basically this means that children develop control over the larger muscles of the trunk and arms which are closer to the body centre (proximal) before the smaller muscles of the hands which are distal (further away from the body centre). Learning to control a pencil or crayon with the hands and fingers is therefore somewhat dependent on how “strong and steady” the shoulder and arm muscles are. As your child develops physically, and takes part in lots of fun gross motor activities such as creeping / crawling, climbing and pushing, the shoulder and arm muscles will get stronger and steadier, and this can have a positive effect on the development of fine motor skills, including pencil grasp. for a better user experience! When your toddler first grabs a thick crayon and puts it to paper (hopefully not to your walls! ), this is the grasp you could be seeing. 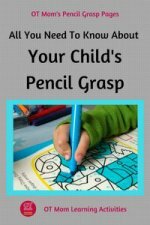 It is a “fisted grasp”, and your toddler will be using movement from the shoulder to get the crayon to move across the paper. As your toddler gains more control over arm and hand muscles, you will see this “palmar grasp” being used. Here, the pencil lies across the palm of the hand and your child’s elbow is held out to the side a bit. The shoulder muscles are steadier, and your child is using the arm muscles to move the crayon around, as well as the shoulder muscles. This photo shows a toddler using a palmar pencil grasp. 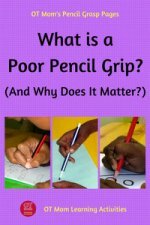 This is sometimes, misleadingly, called an “immature” 5-finger pencil grasp – it is immature because it is not the 3-finger grasp that is used in school, but it is a perfectly mature grasp for a 4-year old! As you can see, there are 5 fingers holding the pencil. With this 5-finger pencil grasp, the wrist is usually held off the table and wrist movements are used for coloring. The crayon is often held very tightly initially, but as the hand muscles develop, you should see a few finger movements emerging. This left-handed toddler has developed a 5 point pencil grasp that is appropriate for her age. By age 5-6, or even a bit later with some children, they should be comfortable using a tripod pencil grip, where the thumb, middle and index fingers are grasping the pencil or crayon. 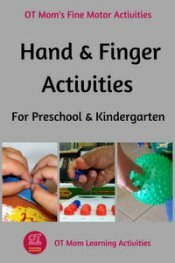 At first, the fingers will be held stiffly and your child may still use wrist movements to draw and color, but as the finger muscles become more skilled, your child will be able to use finger movements to draw and to form letters. Although the tripod pencil grip has traditionally been considered to be the "best" pencil grip because it allows for the most finger movements, there are other ways of holding the pencil that also allow for some good finger movements. 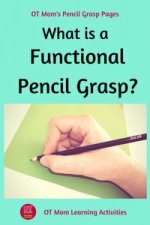 Please read my page on functional pencil grasps to view photos and descriptions of other pencil grasps that may work for your child. 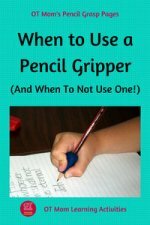 Don’t be surprised if you see your young child switching between pencil grasps. As the shoulder and arm muscles become stronger and steadier, your child should switch less and less. We can liken this to a baby learning to walk – when his legs are tired of walking, he goes back to crawling, but as his endurance and skill improves, he will walk more and more! So don’t discourage your child from going back to an earlier grasp; instead, promote correct pencil grasp development and endurance by working on the the underlying foundations for good fine motor development. Please, do NOT force your toddler to hold the pencil the way a school child does, with 3 fingers on the pencil – you may do more harm than good. It is very hard to “unlearn” a poor pencil grip later in life! When a child is forced to use a “proper” pencil grasp before the shoulder and arm muscles are ready to support it, you may find fine motor problems emerging, such as holding the pencil in “weird” ways, messy work and even avoidance of drawing and coloring tasks. This grasp is appropriate for a young child - don't force a mature grip before the child is ready! So, don’t be in a hurry to make your child draw or color “properly”. 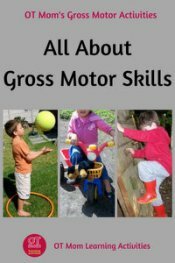 Rather encourage overall development of their Gross Motor Skills and Fine Motor Skills. Using scissors should be a integral part of developing the fine motor control needed to use a pencil. 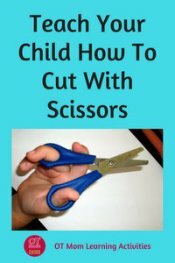 So check out my article on how to help your child cut with scissors. My affordable e-books (pictured below) contain loads of photographed activities in an accessible format. However, if your child has underlying developmental delays or other difficulties, he/she will need additional help and encouragement, so consult your local professional if you are in any way concerned. In response to popular request, I have made a free downloadable PDF of this Pencil Grasp Development page that can be used as a printed handout. Please reference my site when you hand it out. Please do not link directly to the PDF from your site - rather link to this page. Thank you! Free PDF Instant Downloads! Just click the links! Thank you for visiting this page on pencil grasp development! I hope you found it helpful! 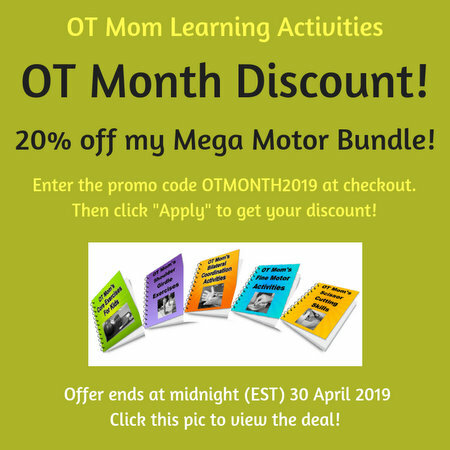 You can receive updates on new pages and activity ideas by signing up for my occasional newsletter: OT Mom Activity Updates. Myers, Beverly. Proprioceptive Neuromuscular Facilitation (PNF) Approach. Occupational Therapy for Physical Dysfunction. Baltimore: Williams & Wilkins, 1995.